Kitsilano is one of the most popular neighborhoods in Vancouver. It's home to Kits Beach, Vanier Park, and West 4th Avenue, one of the best shopping and dining destinations in the city. Like Kitsilano itself, West 4th is sporty, novel and trendy all at the same time. 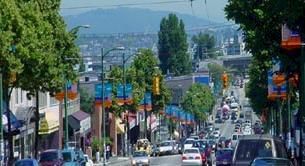 Located just a few blocks north of Kits Beach, West 4th Avenue is a hub for Kitsilano shopping and dining. On "West 4th", you'll find lots of athletic clothes and supplies, stores for babies and maternity fashion, mid-range fashion boutiques, and home decor. West 4th is also home to many of Vancouver's favorite restaurants. West 4th is also home to fun events and annual festivals throughout the year, from the annual eight-block KHATSAHLANO! Music + Art Festival, to Fashion’s First Night in spring & fall, Feast of Fourth in spring & fall, and Miracle on West 4th (December). Use this Guide to West 4th Avenue Vancouver to discover the best shops and restaurants on West 4th! Lululemon was born in Kitsilano (the first Lululemon opened here in 1998), and it's had a definite impact on the local shopping scene: West 4th boasts the biggest collection of athletic/outdoor shops in Vancouver! In addition to Lululemon and the Lululemon-owned Ivivva Athletica, there's also The North Face (everyone's go-to shop for winter/ski wear), Billabong, and Showcase (snowboards and skate equipment), to name just a few. In the winter there are Boxing Day sales and it's a great time to pick up bargains from snowboards to winter wear. In the summertime, the sports stores sell mountain biking and hiking gear for active visitors. Many of the bigger stores can be found closer to Granville Bridge and Granville Island. West 4th Avenue Vancouver is home to two of the best baby stores in the city: Crocodile and Hip Baby. Though the prices at both boutiques are too high for every-day baby supplies, they're ideal spots to find baby shower gifts or accessories for first-time parents. Crocodile also has an extensive array of top-tier strollers. Kitsilano is a popular place for young families so there are many higher-end baby stores along West 4th. For pregnant ladies, West 4th has a few mid-range maternity fashion stores, including Thyme Maternity and Motherhood Maternity. Most of the fashion on West 4th Ave is mid-range (which is to say, it's neither "high-end" nor budget/cheap). It also has a good mix of men's and women's shops (unlike South Granville Street shopping, which has far more fashion for women than men). Fashion boutiques include the Canadian retailer Spank and U.S. chains Urban Outfitters and American Apparel. Two stand-outs are the locally-owned Two of Hearts, which specializes in made-in-Vancouver and independent Canadian fashion. You'll also find consignment and vintage stores such as Turnabout, which specializes in designer clothes and luxury brands. There are many home decor shops on West 4th Avenue, making it an ideal destination for people who like to browse housewares. (Locals love walking up and down West 4th, popping in and out of the home decor stores; you could spend a whole Sunday doing just that.) These shops are also perfect for buying housewarming gifts or wedding gifts. Home decor shops include local favorites Motiv, Briers Home Furnishings, and Ming Wo (for kitchen equipment). West 4th Avenue is home to many of the best-loved restaurants in Vancouver. Las Margaritas, Sophie's Cosmic Cafe (ideal for breakfast or brunch), and Romer's Burger Bar (one of the Top 5 Burgers in Vancouver) are three local favorites that are right in the heart of W 4th shopping. You can also head west on 4th Ave to The Naam, one of Vancouver's Best Vegetarian/Vegan Restaurants. For locavores, there's also Fable Restaurant, one of the best Farm to Table Restaurants in Vancouver. If you're looking for some tea to take home and try, head to West 4th's relatively new addition: Silk Road Tea. The Victoria-based tea company specializes in fresh tea blends and also sells beauty products that contain tea extracts. New, trendy restaurants pop up on West 4th Avenue frequently; there's a pretty high turnover. One option on West 4th is to simply explore the avenue and see what's new; you may get a taste of something special!